Rokos creates playful, functional, sculptural products that behave in unexpected ways. The products encourage a richer interactive experience. Head designer Jim Rokos explores the physical properties of the materials to generate aesthetic, intriguing concepts. The brand offers exceptional quality not compromising at any stage of the process from design to manufacture. Why 22° 36° 48°? The three possible angles at which the bowl can sit. At 22 degrees, the bowl holds its contents modestly. It becomes more inviting when tilted to 36 degrees. And, at 48 degrees, it flaunts its contents for you to share. Ordinarily, a base would interrupt the form of a bowl. Here the three bases are incorporated into the aesthetics of the design. They create its style. 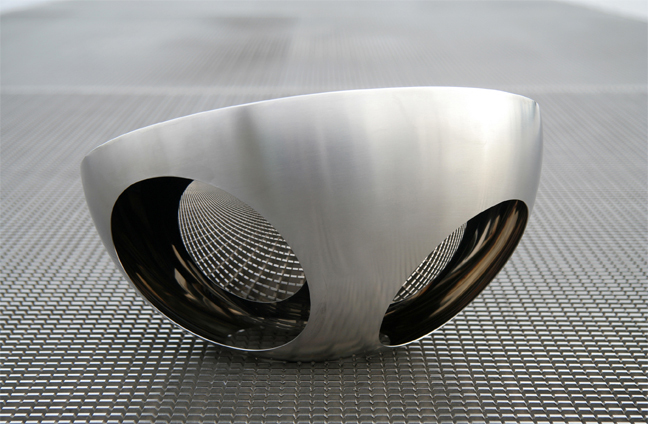 They allow the user to explore the bowl’s sculptural form. 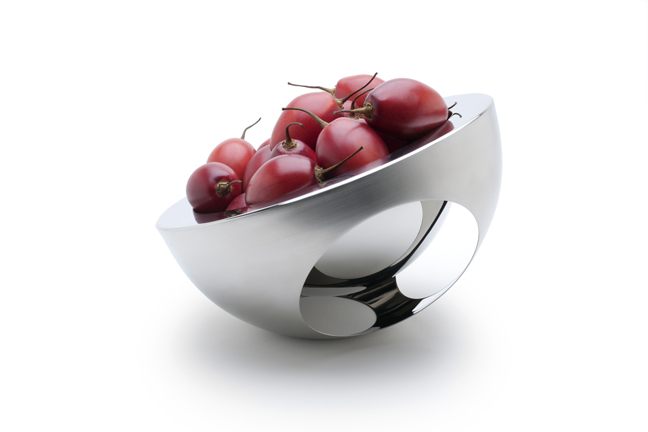 They allow greater flexibility for the bowl to be incorporated into a space. The 22° 36° 48° is a double-walled, welded bowl. Reflections in the mirror-finish hold secrets. Holes in the outer wall reflect in the inner wall. Objects in the bowl are mirrored. Often, in polite company, guests do not want to take the last piece. Here, that last piece is doubled. The guest reaching for the penultimate piece realises too late and clears the bowl. Something is lost when we bring flowers indoors. The flowers are no longer animated by a breeze because the vase holds them rigid. The flowers cannot properly wilt when they are dying because the vase keeps them straight. The Gauge Vase from Rokos takes on the behaviour of the flower. The weight of the water holds the vase upright. The vase ‘wilts’ as the flower drinks the water, letting us know that it needs watering. The intention was to design a shape that would contain liquid and, as the quantity of liquid reduced, it would lean over autonomously, without the intervention of a person. It was important for the viewer to understand that there is no trickery. The use of glass shows that there is no mechanical method to the leaning… Like any vase, the Gauge Vase can be knocked over. Unlike any other vase, the Gauge Vase will spring back up. It is designed for leaning and swaying and will return to where it best balances – upright when fully watered, tilting when thirsty. The narrow neck limits the number of flowers so it does not over-balance. The vase can pirouette and dance. It invites people to play… because the water moves inside – sometimes following, sometimes leading the sway of the glass – an irregular movement is created, reminiscent of flowers dancing in a breeze. Mouth-blown and formed by hand in the UK, without the use of molds. Due to the extensive work required to make each piece, decanters are only produced in limited runs of 20, four times per year. Why 13° 60° 104°? The three possible angles at which the decanter can sit. At 13 degrees, the decanter begins the evening sober. As drinking progresses, at 60 degrees the decanter is a little tipsy. By the end of the evening, it sits at a drunken 104 degrees. The three angles represent standard wine measures. The upright position measures a magnum, the middle position holds a single bottle of wine and the decanter in the downward position needs a refill. Wine changes most once the cork is out, once air touches the liquid. The flavour transforms. But all too often the bottle is empty before the wine reaches its peak, because the rate at which the wine is drunk is greater than that of the transforming flavours. The 13° 60° 104° encourages oxygen into the wine with every turn, as the liquid moves. And the wine’s potential flavours can emerge.